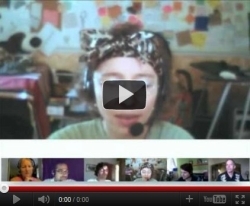 This past summer, I experimented with several different webcast topics and formats. One of the most enjoyable was 'MOOCast'. It was done in conjunction with EduMOOC 2011 and was "an open-ended opportunity for EduMOOC'ers to share resources, ideas, and feedback about assorted eduMOOC topics and/or the MOOC itself". Despite that fact that it was a 'no-prep' show (or perhaps because of it), a diverse parade of talented educators showed up to participate and we had some really interesting conversations. I think MOOC's are great, but as we discussed on the final MOOCast, I'm not a fan of the name itself. Aside from just not liking the sound of the word, I see MOOC's as part of a larger movement toward educators and learners working together and sharing resources online. 'Massive' learning events like Change, MobiMOOC , & Stanford's AI have a valuable impact on those that participate and play an important role the evolution of instructional design. I see these as the 'big hit' portion of the long tail of open education. I think the truly 'massive' potential of open education happens when courses of whatever size are opened up online. Of course this is already happening in variety of ways, but continuing to figure out ways to share and remix resources, collaborate with other educators, and help our learners connect with each other, is essential to reaching the truly massive potential of open learning. With this kind of 'Collaborative Open Online Learning' in mind, I'm happy to announce the launch of COOLCast. Much like MOOCast, this will be an open ended discussion that will include feedback about about current MOOC's. It will also be an opportunity for educators to explore how to work together to open up their own courses. All are welcome. The first show is scheduled for Wednesday, Sept. 14 at 1400GMT (global times at: http://bit.ly/pxnqB3 ). The show will be streamed at http://edtechtalk.com/live . Those who just want to 'lurk' and participate via text chat can tune in there. For those who'd like to join the conversation, we'll be using Google+ Hangout to connect. This basic hangout guide provides some info for those who have not 'hung out' before. Well done organizing COOLCast. When it comes to sharing knowledge and collaborating, it is great to get many heads together. I resisted commenting when I first saw the alternative 'Collaborative' name mentioned, but now I regret that. But I do feel it worth mentioning here that the structure and nature of a MOOC is exactly not 'collaborative'. Let me explain. Most definitions of 'collaborate' focus on the idea that a group of people are working on something in common - shared aims, shared objectives, shared project, etc. and very often they result in becoming a group, a team or a cohesive community. MOOCs and the connectivist approach to learning, as I have argued elsewhere, is by contrast 'cooperative'. There is no presumption of unity, order, shared goals or coherence. There's no sense of being 'in the group' or its opposite. If teams or groups form, they are tangential to the course, and not the core or essence of it. So, if you are discussing 'Collaborative Open Online Learning', you are not discussing MOOCs. Perhaps you are discussing things like WikiEducator or OERu, where everybody is pulling the same way. I don't know. A distinction worth examing, but a pretty blurry one I think. 1. Work jointly on an activity, esp. to produce or create something. 1. Act jointly; work toward the same end. It seems to me that a spectrum of 'working together' goes on in MOOC's and in other 'open online learning/courses', whether by design or not. I understand that for some purposes (like research) differentiation may be neccessary, but I'm just not sure why the distinctions matter in practice. Either way, whatever Google says, the aim of a MOOC is *not* to "Act jointly; work toward the same end." Whose aim ? whose collaboration? That is an interesting approach Stephen. You seem to suggest that there is one aim for a MOOC. Of course in any human organisation (i.e. involving more than one person) there may be multiple aims, possibly overlapping but distinct. What would you do if a number of people decided to work jointly towards a common end on your MOOC? Would you ban them for disobeying your network principles or your MOOC definition? Is there really a distinction between the two? It is possible that one can lead to the other in a cycle. The collaborators bring knowledge from outside, knock it around in the group and then share the knowledge with other groups and people. It is only when the knowledge is not shard freely, inwards and outwards, that the model breaks down. I think "collaborative" might have been an effort to open this beyond MOOCs, though Jeff may correct me. As someone running something different (not big enough to be a MOOC, but open, yet structured, with a goal, and tasks, but free-form in many aspects), I appreciate that effort and think I can contribute more to the conversation. MOOCs seem to be collaborative in their inception and development. So do the research projects that stem from them. And often people in them collaborate, even though the intent and design may be more connectivist than collaborative. So if the larger term is designed to include OERs, and experiments like I'm doing, and encouragement of openness in general, and discussion of what that openness means (and its implications, good and bad), then these things may be collaborative in that we develop them in the context of what admittedly is a rather small group, even if that collaboration is not intentional or does not precisely fit the definition.